Alexandrea (call her Ali) Elman's attention to detail and flawless taste are evident upon setting foot in any of the establishments she's had a hand in creating. The Santa Barbara-based business woman is the co-founder of our favorite eco-friendly nail salons Base Coat (which now had two locations in Los Angeles and two in the greater Denver area) as well as co-founder of Denver's chic Black Eye Coffee. 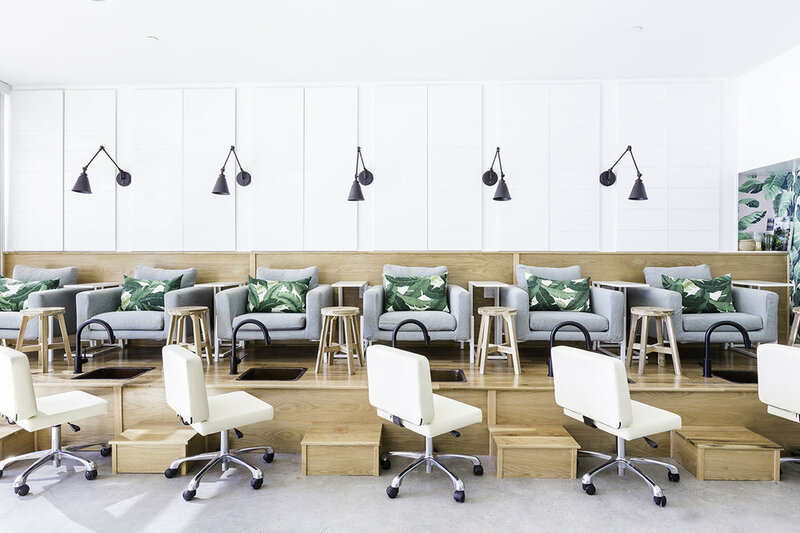 With Base Coat, along with partner Tran Wills, Elman offers patrons a safe, non-toxic environment (utilizing their own line of 8-free polishes and plant-based products) that also happens to be totally stylish and Instagram-worthy — which we have to admit matters nowadays. And besides helping create the dreamiest destinations, Ali is also a devoted wife and mama to daughters Mo and Marlowe. That said, we thought she would be the perfect woman to ask for tips on balancing motherhood and being an entrepreneur, as well as how she first caught the business bug, and how her new baby has changed the family dynamic for the better. You've got your hands in a couple different businesses! How did you first get your feet wet in the entrepreneurial world? For as long as I can remember, I knew I wanted to own my own business. Part of the draw to it was being able to create. Hospitality was something that felt natural to me and when I saw a need for a coffee shop in my then neighborhood in Denver, I jumped at the opportunity. It felt good to create a space for community. What prompted the opening of Base Coat? Base Coat was the brainchild of my partner Tran Wills. I loved the idea of a clean and safe environment to get your nails done — especially in a beautiful setting. When she approached me to join forces, I was excited to help take it to the next level. Can you expand on your interest in creating eco-friendly products and services? Why is this important to you? The idea of Base Coat came to my partner when she couldn't find anywhere safe to get her nails done while she was pregnant. Then she got to thinking, why aren't there safer, more eco-friendly options in the nail salon world for both the clients and the workers? When you start to dive into the world of nails, you unfortunately see a lot of mistreatment of employees and the use of health harming chemicals. We want to prove that it doesn't have to be that way and we are trying to set a better example and higher standards. How do you and your family stay "green" in your home life? All our products — from cleaning supplies to lotions — are on the spectrum of “natural products.” The thing is that we are exposed to hundreds of chemicals every day. You can't avoid them: it's part of our food, water, containers, shampoos. Choosing to reduce the number you are exposed to is all you can do. You recently added baby Marlowe to your brood! What new challenges do you face with having two instead of one? Two is a whole other level! When you have one child, you and your partner can take turns, giving each other a break. But with two kiddos, you just have to divide and conquer! There are no breaks, but I couldn't imagine life without Marlowe. Our home feels complete with our two girls. What's the best tip you have for moms who also have dreams to start their own business? Think carefully about what's important to you. If you want to start a business because you think it will free up more of your time, you should think again. I say write down all your motivations for opening a business and then keep checking back in with them while you are in the process of diving into the endeavor. If things are lining up and still feel aligned with your original goals for being a business owner, stay the course. But if you are suddenly finding that you had more stress and less time than before, it's time to rethink your strategy. Remember when your kids are grown and out of the house, you are likely not going to look back and say, “I wish I worked more when my kids were little.” Cherish the time you have with your kiddos and remember how incredible it is to be a badass momma, that alone is a huge accomplishment..